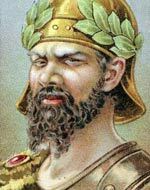 Attila the Hun, was King of the Huns, a nomadic central Asian tribe that settled near the Danube. Attila rose to be a powerful king claiming sovereignty over all the tribes between the Baltic Sea and the Danube. His army was formidable and created an empire stretching from the Rhine to the frontiers of China. Attila and his army were given the nickname the ‘Scourge of God’ for their reputation for creating a trail of devastation wherever they went. In 451 he invaded Gaul but was defeated by the Romans and Visigoths. The next year he tried invading Italy but was persuaded to end his invasion by Pope Leo I.
Attila died in 453, on the night of his marriage. After his death, his empire soon dissipated, but his reputation remained. A description of Attila by Jordanes, who cites a description given by Priscus.